“The Wolf and the Witch” opens THIS WEEKEND! Posted on October 1, 2014 by admin | Comments Off on “The Wolf and the Witch” opens THIS WEEKEND! 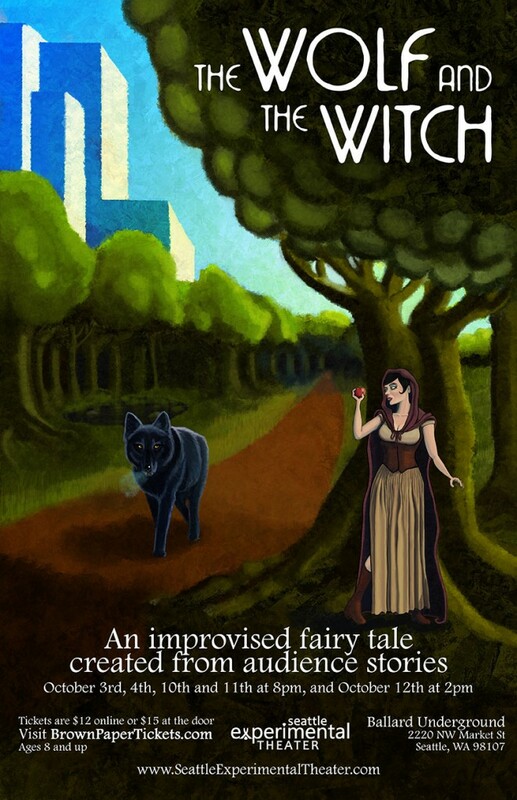 We are beyond excited to be bringing the world premiere of our new improvised fairy tale show, “The Wolf and the Witch”, to the Ballard Underground for 2 weekends starting THIS FRIDAY October 3rd and running through October 12. And for those with families, did you know that we’re one of “Erika’s Weekend Picks” on SeattlesChild.com this weekend? Advance tickets are just $10 for the kids, and $12 for all other kids at heart. Our show is appropriate for ages 6 and up. All shows at 8PM except for the Sunday, Oct 12 matinee performance at 2PM. Finding the front door can be tricky, a bit like a fairytale journey. The Ballard Underground is located between Bop Street Records and Great Harvest Northwest. Take the street level door down the staircase and our lobby is the second door on your left. If you hit the Metaphysical library, you’ve gone too far! This entry was posted in Announcements, Performances, The Wolf and the Witch. Bookmark the permalink.